Ouch! this is going to hurt! Well you might remember that one of my new year’s resolution was to try and get back into listening to fiction books, setting myself a target of 12 new books in the year, that’s roughly one per month. To ensure that I keep to the target, I have decided to write a short review about each of the books I read. The first one was ‘Ready Player One’ – next up, one which was recommended to me by colleagues from work – “This Is Going to Hurt” by Adam Kay. 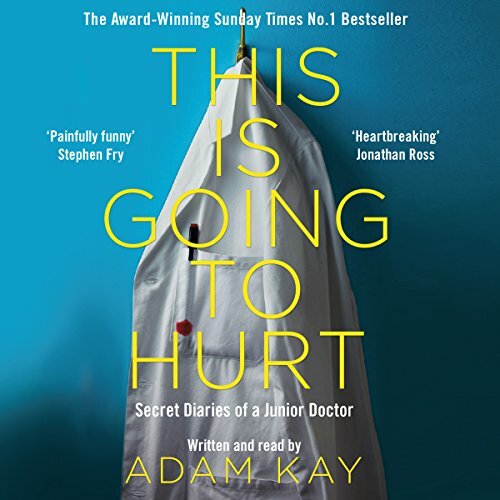 Obviously I don’t want to give away too much of the book, but briefly, the book takes the form of extracts from Adam’s reflective diaries as he progresses through his career as a junior doctor. Although the names and identities of the patients he encounters are anonymised, he does not try to hide either the details of the events or the hardships of working within the National Health System (NHS). Some of the events are quite, well disgusting, but these are communicated well and the abundance of humour makes you cringe in a funny way at the exploits of the patients who he comes into contact with. The ending is particularly poignant. If I was rating the books which I read this would definitely get a ten out of ten. I have to admit, that as I was listening to the book walking into work, I actually did laugh out loud at times, much to the amusement of the people I was walking past. The story is split into the diaries entries and so it is easy to dip in and out of the book. If you are reading it at night or listening to book, there are plenty of points where it is convenient to pause the book or insert your bookmark. I would say that although the book keeps all the details of the encounters, it is not gory at all and the medical approach to things keeps it so the blood and other bodily fluids are not too stomach wrenching. The audiobook is actually narrated by Adam himself, and I think this adds a very personal touch. You really empathise with him and his patients as you progress through the book. I was once told that the art of a good public speaker is to have a laugh with the audience and then bring them back to reality with a bang, and the book certainly does this. If you have time, or the inclination, then I strongly recommend that you read/listen to this book. If you listen to the audiobook there are some extra entries at the end and an interview with Adam himself (I’m not sure whether this is in the paperback version of the book). If you have read it, then please let me know in the comments below and, if you are reading this Adam, well done! One of the best books I have ever listened to. It has certainly impacted on how I view the NHS and I will always have a smile and a thank you for everyone who works within the service.